Perhaps fittingly, the rain started to fall outside just as the Galway players emerged into the lobby of their hotel. Media patrolling the reception area of team hotels the morning after an All-Ireland final is a GAA tradition, but for the losing team, it’s probably one of the most unwelcome ones. 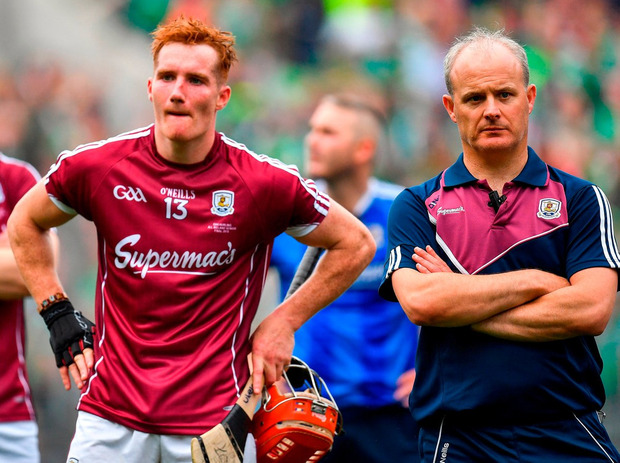 While out in Citywest Limerick players lifted the lid on their year and the breadth and depth of the emotions they’ve experienced since James Owens’ final whistle, Galway players were understandably less talkative. A couple of requests were politely declined. Would you mind reliving your misery for us one more time? No thanks. Manager Micheál Donoghue obliged. And in the Burlington, just a few yards from where Derek McGrath started the post mortem for Waterford almost 12 months ago, Donoghue sifted through the embers. Their two-in-a-row dreams and all the lovely symmetry that would have brought lay in ruins. Donoghue shunned all the easy outs available to him. The injuries and the schedule could be fingered for blame, but this is Limerick’s time. “I don’t want to detract anything away from Limerick. On the biggest day you’re always trying to get that desired performance and in fairness they came out and played the game on their terms,” he said. Donoghue didn’t accept the ‘miles on the clock’ argument either. Of the 15 players that started for them on Sunday, four (James Skehill, Johnny Coen, David Burke and Joe Canning) were involved from the off in the 2012 decider. A further six (Fergal Flannery, Joseph Cooney, Conor Cooney, Jonathan Glynn, Davy Glennon and Aidan Harte) were on the bench that day as they lost to Kilkenny. “The reason they are such a great bunch to work with is they are so committed and so determined to be successful. Look, they have to go back to the club now and play a lot of club games for the next two or three months, so that’s going to take its toll as well. “Hopefully when they do get their down time that builds up the hunger for next year. “In fairness to Limerick, they were playing brilliant hurling and had massive momentum. The biggest thing is hunger and desire and they had that in abundance, but so did our lads. “It was a massive opportunity. We never really talk about winning or losing the game, but we all wanted the same thing and it was a big opportunity yesterday. Leaving Croke Park, the general feeling was that while Galway flirted with finding their best form at times, they could never quite sustain the levels of performance they reached in 2017. “I don’t think two years are going to be the same or even two games. When we get the time to reflect back on it, we came through the provincial fairly okay and had some massive games against Kilkenny and Clare,” Donoghue said. It was a vintage summer for hurling, but Donoghue believes that the GAA may need to look at loosening the schedule a little after a hectic campaign. “This is only my view, but I think Croke Park, the powers that be, need to sit down with all the parties,” he said.